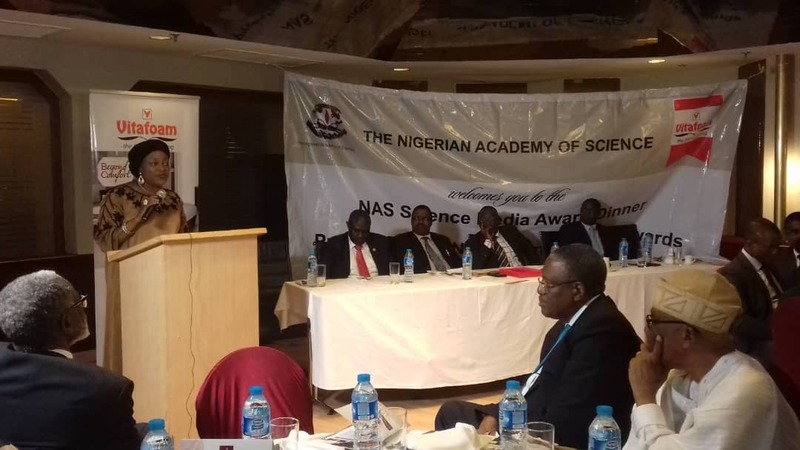 The Nigerian Academy of Science (NAS) held its 8th Science Media Award Dinner on Tuesday, 23rd of October, 2018 at Sheraton Hotel and Towers, Ikeja Lagos. 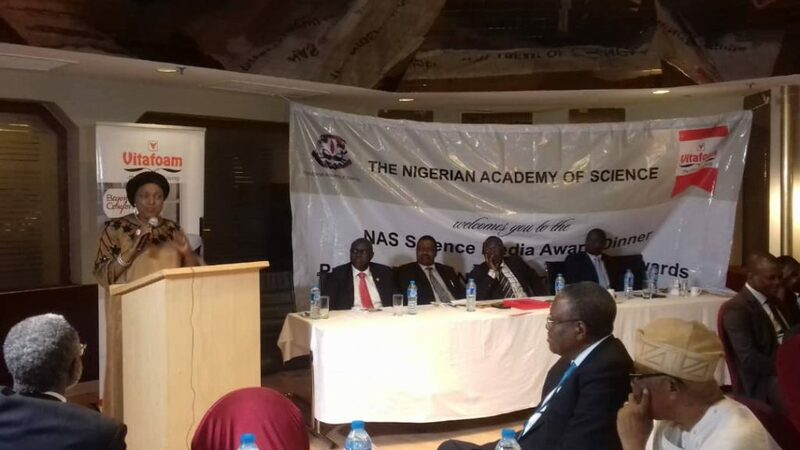 The NAS Science Media Award was endowed by NAS in 2010 to promote excellence in Science and Science-related Journalism. The awards are open to all print and broadcast journalist who published science or science-related stories (health, environment etc.) in the previous year. The opening address of this occasion was by the Public Affairs Secretary of NAS – Prof. Sunday Atawodi, FAS. The NAS President, Prof. Mosto Onuoha, FAS was the chairman of the occasion. He stated that science is so important yet so underrated in our society. In this regard, NAS aims to ensure the gains of science are transmitted to the people and eventually, into policy making. NAS is the foremost dependent scientific body in Nigeria, dedicated to the development and advancement of Science, Technology and Innovation in Nigeria for socio-economic development of the country. The major partner for this year’s NAS award is Vitafoam Nigeria plc, which has been interested in sponsoring science related projects beyond form making. 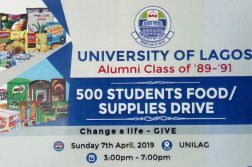 They also recently donated a polyurethane laboratory to the University of Lagos. The Managing director of Vitafoam, Mr Taiwo Adeniyi mentioned in his goodwill message that we need to innovate and diversify our economy. He also informed the audience on the common misconception about the company saying, “Vitafoam has moved beyond making mattresses as they are now introducing cutting edge innovative products into the market”. The keynote address of the award dinner titled, “The Nexus between Science and Media: Gaps and Opportunities” was delivered by Mrs Eugenia Abu- the Creative Director, Essential Communications and Managing Partner of The Eugenia Abu Media (TEAM). 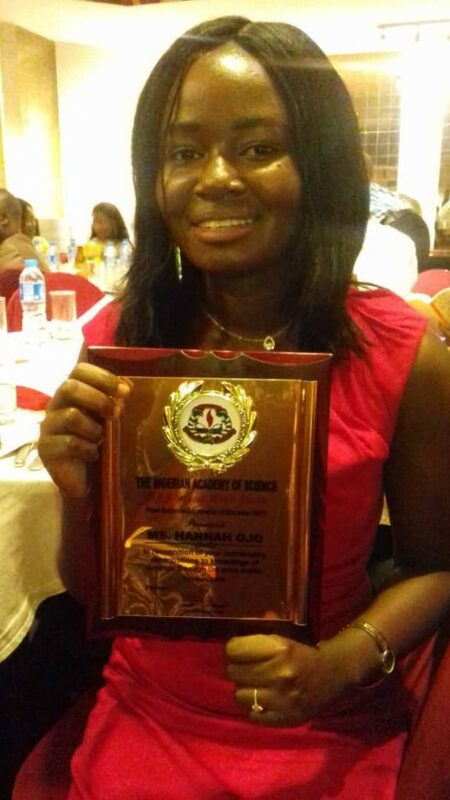 She worked in the Nigerian Television Authority (NTA) for about 34 years and received the Nigerian Media Merit Award for the Best Newscaster of the year in 1985. She is an author and has won the ANA/NDDC Flora Nwapa prize in 2008 for best women’s writing. A media strategist and also a member of several national and international organizations, Mrs Eugenia Abu also runs a mentorship program and has mentored over 200 youths. She has also interviewed some notable world leaders and personnel like the former secretary-general of the United Nation Mr Ban Ki-Moon, Former President Olusegun Obasanjo, former president Ellen Johnson Sirleaf and Prof. wole Soyinka among many other. She was voted the most inspiring woman and 2013 ambassador of Vlisco. Mrs Eugenia Abu during her speech at the event gave a few thought provoking questions as follows: Are policy makers well educated and have the understanding in science to make strategic decisions? Does the media understand the scientist and their work? Does the scientist understand the media and their work? Or Are the scientist savvy enough to understand the use of media to promote their researches – get their works out there in a simplified way? A major point of her address was to learn how to balance these two sides – Science and the Media. Butressing that scientific illiteracy provides low level discussion, she urged journalist to do more science-related reports. She then went further to state that, “Scientist and journalists have as much similarities as differences”. As they both rely on investigations and researches to get their work done and both look for evidence to support it. They both also work to effectively communicate with the society they exist in. 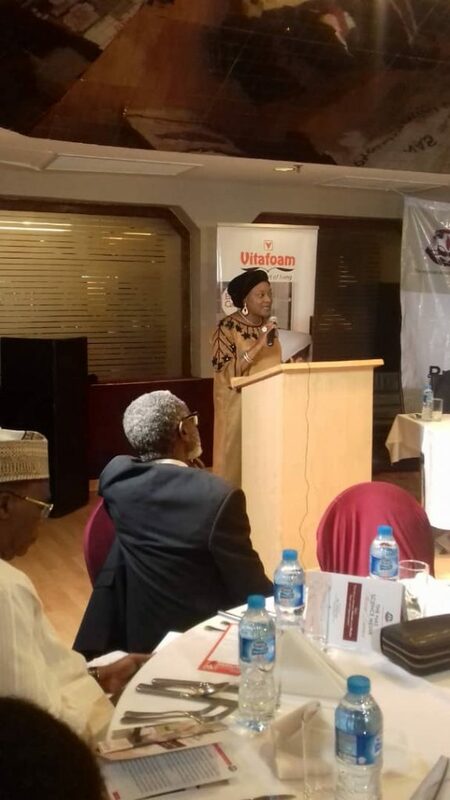 She mentioned a few prominent scientist who made use of the media, like Dr Sanjay Gupta (a top level correspondent Medical Journalist with CNN), Chris Anyanwu (a petroleum correspondent on NTA who went on to become a legislator), Late Godfrey Odu (NTA’s iconic foreign news correspondent who studied Zoology and become a successful journalist), Mrs Moji Makanjuola (who wasn’t a Scientist but a Science journalist well known for her work in the medical field as a journalist on NTA) and Dr. Carl Sagan (an astronomer who presented Cosmos, a TV programme to break down astronomy to non-scientists for many years) but was snubbed by other scientists for trying to break down science through media, describing this action as frivolous, which is why Sagan was denied admittance into the American Science Academy. She therefore urged scientists to respect those who try to associate with the media, not dismiss them and scientists to take lessons in Media, Communication and Public speaking as this would also contribute immensely to building their careers as professionals. She also addressed the issue of journalists or reporters not being taken seriously, emphasizing that, “A reporter has a great role to play, because if a journalist is not present at an occasion, it’s as good as the occasion did not happen at all”. She advised that Journalists dress properly and professionally always, and take themselves seriously in order to be taken seriously by others. Explaining that the major reason for the discord between Scientists and Journalist is that most scientists see journalists as people who do not have regards for their research works as they usually water it down or dismiss their long years of hard work on researches in about two sentences when publishing (making the article loose its worth, essence or impact) while the Journalist thinks that science is boring and would rather pay more attention to entertainment news. This problem can be solved with both parties trying to communicate better, understand each other and also doing trainings or researches in each other’s fields. 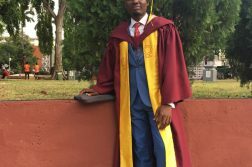 Afterwards, the executive secretary of NAS – Dr, Oladoyin Odubanjo – talked a little more about NAS being one of the oldest academies on the continent while the NAS Media Awards is probably the first on the continent by any academy. One of the major functions of NAS is to bring scientific knowledge to positively guide policies and strategic direction of the country hence policy makers will be better informed and make better decisions for the populace. He also gave an overview of the entries for the award, stating that, the normal criteria was usually one entry per applicant but this year, each applicant needed three entries. There were 24 entries in all and 4 judges to grade them. Finally, Prof. Sunday Atawodi announced the winners for print journalism as there were no entries for broadcast journalism. Jesusegun Alagbe (Saturday Punch) was announced the runner up on print for his report titled “Agony of deaf Nigerians in the hands of doctors who don’t understand them” and Prof. Onuoha announced the winner as Hannah Ojo (The Nations newspaper) for her report titled, “This is Lagos: city of aquatic splendour, dry taps” and a two part series titled “Poison on parade: Lagosians risk death by instalments as laboratory tests reveal poisonous contents paraded as pure water”. The winner, Miss Hannah Ojo was presented with a plaque, a sum of two hundred thousand naira and a gift voucher worth fifty thousand naira from Vitafoam Nigeria Plc. Mr Lekan Sanni gave the closing remarks and the event ended with dinner served to guests.